The game remained scoreless in the early innings, with only two baserunners apiece for each team through the first three innings. The Giants loaded the bases with two outs in the top of the 4th inning, but Brian Johnson struck out to end the inning. The first runs of the game came in the bottom of the 5th as Henry Rodriguez singled to lead off the inning and scored on a home run by Gary Gaetti to give the Cubs a 2–0 lead. The Cubs threatened again in the next inning with singles by Lance Johnson and Sammy Sosa. Rich Rodriguez relieved Gardner, but loaded the bases with a walk to Mark Grace and allowed a single to Matt Mieske which scored two more runs and extended the Cubs' lead to 4–0. John Johnstone relieved Rodriguez and closed the inning without further scoring. 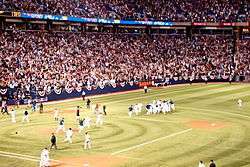 Chicago's win clinched the team's 15th postseason berth in franchise history, their first in 9 years since losing in the 1989 National League Championship Series. The Cubs' presence in the postseason, playing for a spot in the World Series, led several sportswriters to reference the Curse of the Billy Goat and the difficulties the Cubs' had faced since 1945. The Billy Goat story suggests that Billy Sianis cursed the Cubs after he and his goat were asked to leave game four of the 1945 World Series. The playoff berth matched the Cubs with the Atlanta Braves in the NLDS, where the Cubs were swept three games to none. The Cubs have not made the World Series since 1945 and have not won a title since 1908. However, the Cubs would go onto win the National League pennant and World Series in 2016, their first NL pennant since 1945, and their first title since 1908. "September 28, 1998 San Francisco Giants at Chicago Cubs Box Score and Play by Play". Baseball-Reference.com. Retrieved May 29, 2010. "Retrosheet Boxscore: Chicago Cubs 5, San Francisco Giants 3". Retrosheet, Inc. Retrieved May 29, 2010. 1 2 Cruze, Tom (September 29, 1998). 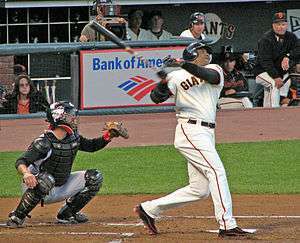 "Bye, Bonds: Giant lives down to playoff history". Chicago Sun-Times. ↑ "Mickey Morandini Statistics and History". Baseball-Reference.com. Retrieved May 6, 2010. ↑ "Jeff Blauser Statistics and History". Baseball-Reference.com. Retrieved May 6, 2010. ↑ "Henry Rodriguez Statistics and History". Baseball-Reference.com. Retrieved May 6, 2010. 1 2 "Single-Season Leaders and Records for Home Runs". Baseball-Reference.com. Retrieved February 17, 2010. ↑ "September 23, 1998 Chicago Cubs at Milwaukee Brewers Play by Play and Box Score". Baseball-Reference.com. Retrieved May 6, 2010. ↑ Behrens, Andy. "ESPN.com: Page 3 – 'This Old Cub': A tribute to Ron Santo". ESPN.com. Archived from the original on 16 March 2005. Retrieved March 3, 2005. ↑ "Standings on Friday, September 25, 1998". Baseball-Reference.com. Retrieved May 6, 2010. ↑ "1998 National League Season Summary". Baseball-Reference.com. Retrieved May 6, 2010. 1 2 3 4 5 Ginnetti, Toni (September 25, 1998). "Cubs get bye with 3-way tie". Chicago Sun-Times. ↑ Podgorski, Al (September 28, 1998). "Magic number: 1 more; Cubs lose, but live to play again". Chicago Sun-Times. 1 2 "Chicago Cubs Team History & Encyclopedia". Baseball-Reference.com. Retrieved May 6, 2010. ↑ Cruze, Tom (September 29, 1998). "At last, there's joy in Wrigleyville". Chicago Sun-Times. ↑ Domke, Ellen (September 29, 1998). "Brown can sleep easy after win". Chicago Sun-Times. ↑ Green, Michael; Cruze, Tom (September 29, 1998). "Hey, hey! Holy cow! ; Blue Heavy; Cubs in playoffs for the first time in nine seasons". Chicago Sun-Times. ↑ Gatto, Steve. Da Curse of the Billy Goat. Protar House, LLC. ISBN 0-9720910-4-1. ↑ "1998 National League Batting Leaders". Baseball-Reference.com. Retrieved May 29, 2010. ↑ "1998 National League Pitching Leaders". Baseball-Reference.com. Retrieved May 29, 2010. ↑ "Single-Season Leaders & Records for Saves". Baseball-Reference.com. Retrieved May 29, 2010. ↑ "1998 National League Awards, All-Stars, & More Leaders". Baseball-Reference.com. Retrieved May 29, 2010. ↑ "1998 Awards Voting". Baseball-Reference.com. Retrieved May 29, 2010. ↑ "September 28, 1998 San Francisco Giants at Chicago Cubs Box Score and Play by Play". Baseball-Reference.com. Retrieved May 29, 2010. ↑ Gregor, Scot (September 29, 1998). "Once again, Bonds fails in the clutch". Chicago Daily Herald. ↑ Fainaru-Wada, Mark; Williams, Lance (2006). Game of Shadows. New York: Gotham Books. pp. 38–39.